Real estate in SF is up 33% since its low in March 2009. To someone living in the Bay Area thinking about buying a house that seems daunting. And it doesn’t help that the likes of Twitter, Dropbox, Snapchat and Facebook have crazy valuations. 1) How much appreciation can I expect if I have to buy now and decide to sell in 5 years? 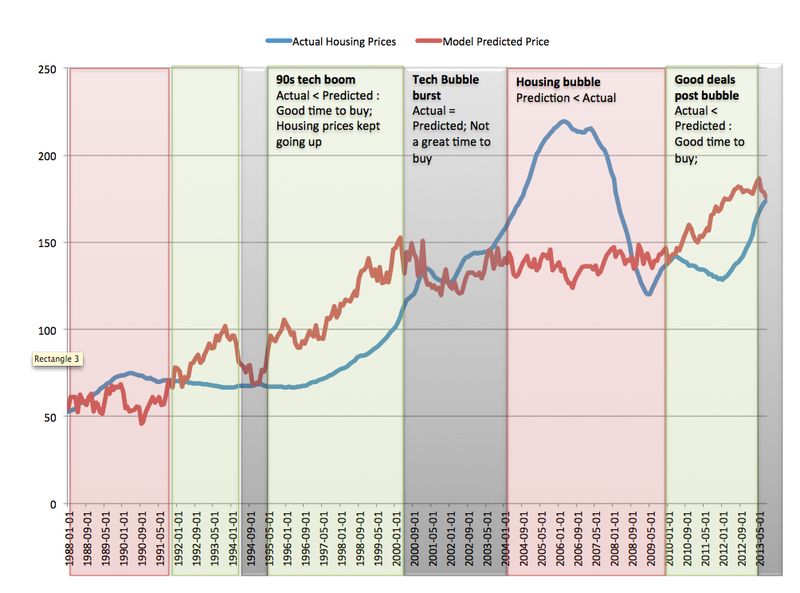 2) If we are in a mini tech bubble and the bubble pops, what will be the impact on housing prices? 3) Long term interest rates – 10 year US treasury note to reflect what’s happening in mortgage rates; one flaw is that I haven’t taken into account the risk premium associated with mortgages which is also changes. These are used to priced the home price index for SF (~25 years of data). Here is a plot of all the variables indexed to 100. 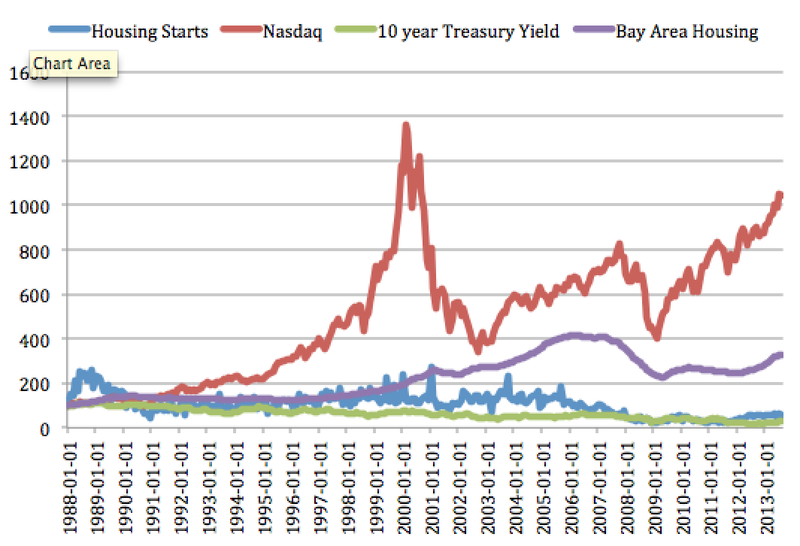 One thing to note here is that when the tech bubble burst housing prices slid only 10%. So that answers the question about if there is a bubble in social media the impact on housing prices may not be severe necessarily. Where does it work and where does it not? Model correctly predicts that home prices should not have risen in 2004-08 era. This means that given interest rates, Nasdaq, and supply the market was valued higher than these fundamental indicators would predict. If you bought then you would be taking a risk that values would adjust back to what was suggested by these indicators and you could lose money. So now we can develop a measure of how good of a time it is to buy a house: when the prediction is much lower than the Home Price Index, don’t buy prices could fall (the red areas in the graph above). When the prediction is much higher than the Home Prices Index, homes are undervalued. Time to buy (the green areas). Let’s test how accurate this would have been. Take a new variable which I will call Delta = Predicted prices / Actual prices. So in times when Delta > 1, you are getting a good deal (green areas in the graph above). Now we plot Delta versus the 5 year forward return on home prices (unlevered) if you had invested in a home at that time (see Figure below). For example if you bought in 1988-01-01 (the first point), Delta would be 1.15 so it would be good time to buy (Delta >1). So if you bought then the red line represents that if you bought in 1988 your home would have appreciated about 1.3x or 30%. 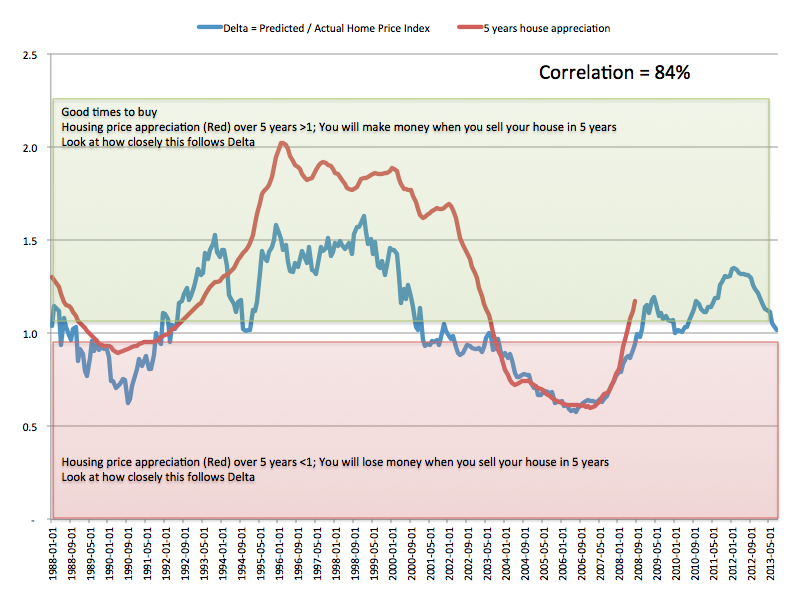 The correlation between the measure of Delta and the 5 year appreciation is 84% and further more whenever the 5 year home price appreciation has been negative ‘Delta’’ has been less than one. Thus I can feel good if I buy a home I can predict the 5 year appreciation based on the delta and as long as Delta is above 1 I won’t lose money. At the end of the graph you will see delta (the blue line) is hovering around 1. Based on where the Nasdaq, 10 year rates, and supply is right now, buying now will not yield to you a big upside in 5 years. You could wait to buy when Delta is >1 but it could take 5-7 years. If you can’t wait that long, find something you feel is a relatively good deal but be picky. Update: Excel model incase you want to change / update.